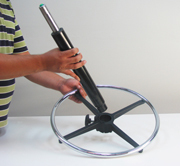 Our 20'' diameter foot ring is wider than those on conventional drafting chairs. This larger size is better for high straddle perching postures and saddle chairs. However, it can also be used on conventional drafting chairs. Important! 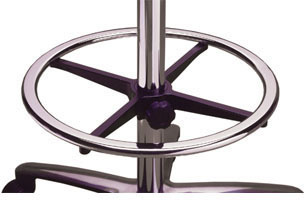 For safety and stability, please make sure that the diameter of your chair base is greater than the diameter of the footring. 2'' (50 mm) diameter bore hole fits the standard pneumatic cylinders used on saddle chairs from Bambach, Salli, and Jobri. Please make sure your cylinder is the correct size for this footring. Chrome ring is flattened on the top surface for improved foot comfort. Following are chair disassembly and footring installation instructions for specific chairs. The same techniques may also work for your chair. Feel free to Contact Us if you have questions. How to assemble the Bambach Saddle Seat with a footring. How to disassemble the Bambach Saddle Seat.